The ankle is one of the joints that is often ignored until it gets injured. The fact is the ankle plays a very important role in improving runners performance, preventing injury and promoting flexibility. The force that results with step we take has to be absorbed by the ankle which means developing an ankle that has good mobility is valuable. The problem is with a joint that is often ignored; it may be difficult to find the right exercises. This article will help you learn how to increase ankle mobility by doing seven easy exercise at home. First, let us understand some important terms we will be using. A simple way to test your dorsiflexion is to stand with your feet close to each other on the floor and then lift up the balls of your feet so that your heel is firm on the ground and the rest of your foot up. The opposite of this is called plantar flexion which is the opposite- the ability to move your foot downwards. An example of the importance of this skill is that of a ballerina who can stand on her toes carrying the entire weight of her body. These two actions are very important, especially for runners. There may be other factors that trigger poor flexibility. Whatever the case, here are seven amazing ways you can build ankle mobility. The first and last exercises may also be used to test whether you too have this problem. It is best to perform these exercise barefoot. If you are able to pull your foot up to 1 inch away from your wall, you have good dorsiflexion but if you can’t then this needs improvement. This exercise helps contract the muscles around the joint to protect it which makes ankle tissue more flexible. This is something you can do whenever you are seated. It helps to improve the strength on the back side of the ankle. This exercise helps you control your ankle movement better. 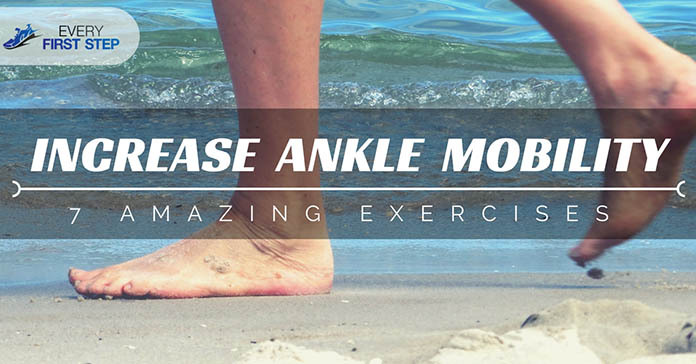 This is a great exercise to improve the range of motion of your ankle. This exercise is a great way to measure your current dorsiflexion and monitor progress. If you are able to achieve 4 inches above distance from the wall, you pass the test. Otherwise, you need to increase your ankle mobility greatly. Being able to increase ankle mobility will help you generate maximum force. This will result in better quality runs and higher endurance which will make sure you get the most of your running. Sadly, many people are unaware that they have ankle mobility problems that need fixing, the tests mentioned in the article can help you identify if you have such a problem yourself. You could also try to using some running shoes for ankle support to avoid injuries. We hope you found some valuable information to help you become the best runner possible. We would love to hear what your thoughts are. Which exercises do you use in order to improve ankle mobility? Let us know what you think in the comments below. If you know someone who will benefit from the information provided here, please share. What Does Dorsiflexion Do When Sprinting?